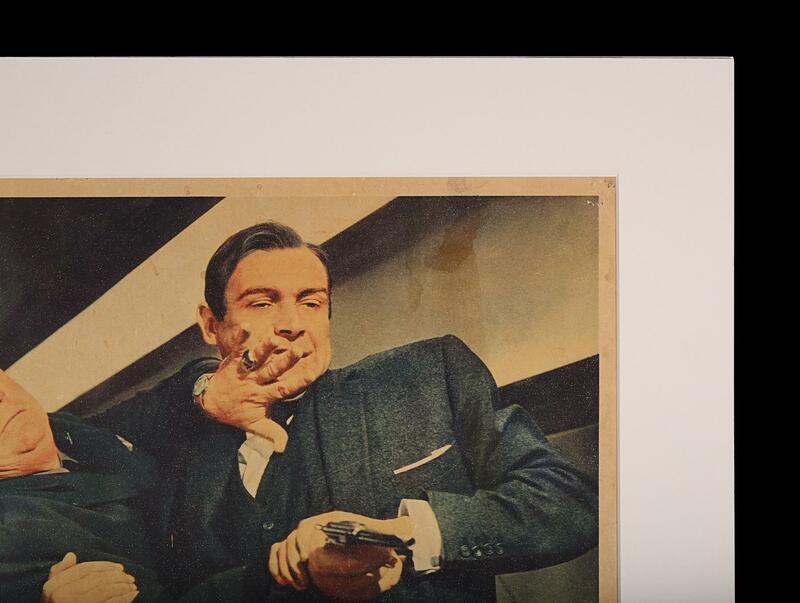 Cinema Poster Auction - November 2018 (#132) 11/20/2018 12:00 PM GMT CLOSED! 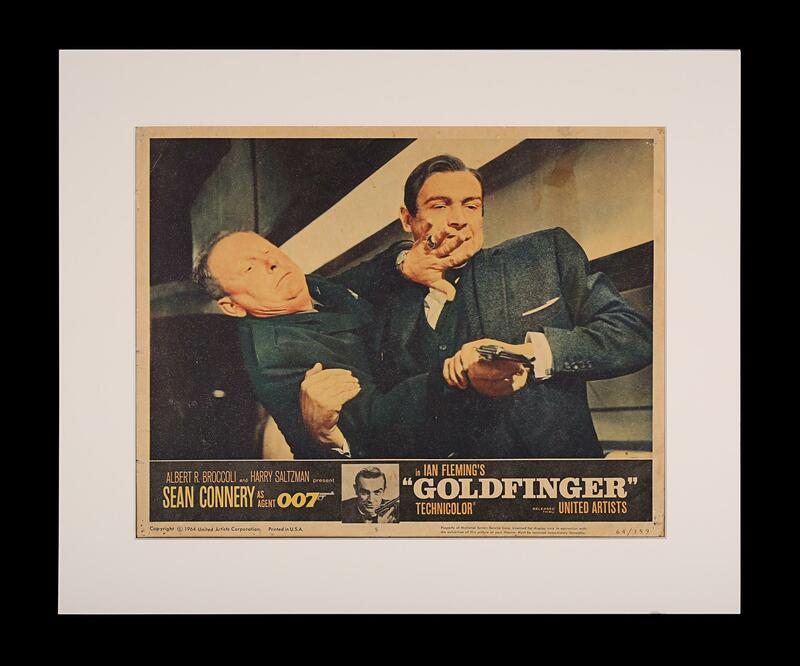 A mounted original US Lobby Card for the Sean Connery James Bond film "Goldfinger" (1964). The LC shows Bond grappling with Goldfinger. Mounted with pin-holes to corners and a light mark top right but overall in good condition. The LC has the correct 11" x 14" dimensions. The auction is being held live in London on November 20th at 12pm BST. Bidding can be done in person, via Prop Store’s online auction platform, or telephone. Buyer's Premium of 23% (plus VAT if applicable) will be added to all winning bids. [†] These lots are sold under standard VAT rules. For buyers within the EEC, 20% VAT will be due on the hammer price; 20% VAT will also be due on the Buyer’s premium. If EEC based buyer is a business outside of the UK who has provided their VAT number, no VAT will be due. When lots are exported outside the EEC (proof of export required or shipped by Prop Store or through Prop Store’s authorised shipper), no VAT will be due on the hammer price; 20% VAT will be due on the Buyer’s premium only; unless items are exported to a registered business outside the EEC, in which case no VAT is due. [M] These lots are sold under the margin scheme. For buyers within the EEC (private individuals or registered businesses), no VAT will be due on the hammer price; 20% VAT will be due on the Buyer’s premium. When lots are exported outside the EEC (proof of export required or shipped by Prop Store or through Prop Store’s authorised shipper), no VAT is due. [US] These lots are currently located in Prop Store’s Los Angeles facility and will ship directly to the buyer from the Los Angeles facility. For buyers within the EEC (private individuals or registered businesses), no VAT will be charged by Prop Store on the hammer price; 20% VAT will be due on the Buyer’s premium. For buyers outside the EEC, no VAT will be charged by Prop Store. Payment plans require an immediate 20% non-refundable down payment. The balance can be paid off in equal instalments over the agreed months. All funds are non-refundable. No cancellations, transfers, or exchanges will be accepted. Your piece will be safely set aside for you and will ship once the balance is settled in full. 3.1.2.1. at least one (1) form of ID is required which must include one (1) government-issued photo identification. If this does not state your current address, proof of address will also be required. 3.1.2.3. a person registering as an agent to bid on behalf of a third party must bring the appropriate identification documents as set out above for themselves and for the third party on whose behalf they are authorised to make a bid and provide to Prop Store a signed authorisation from the third party confirming their authority to participate at the Auction on that third party’s behalf.